Showing results for tags 'striped bass'. I wanted to share this FaceBook post with the group. I have met Captain John and he gets the importance of a sustainable fishery for all. I suggest those of you that share these same views read the article below and email NY Senator Kaminsky. CALL TO ACTION: Looks like we need to get those letters written now to Senator Kaminsky. The NY Recreational & For-Hire Fishing Alliance is prodding their members to send letters to Senator Kaminsky seeking to have John McMurray removed as his proxy and inserting a proxy more beholden to the for-hire fleet. So now we need to have these emails show up in numbers – big numbers. Emails should be sent to Senator Todd Kaminsky at kaminsky@nysenate.gov; his aide Haile Meyers should be copied on the email; her email address is meyers@nysenate.gov. Some points that you may want to reflect in your email - PLEASE PERSONALIZE YOUR LETTERS - they do not need to be long: 1. The email that you are writing is in response to an online posting by the NY Recreational & For-Hire Fishing Alliance (NYRHFHA) seeking John McMurray’s removal (BE SURE TO INCLUDE THIS FACT). 2. Fisheries Management must be based on the best available science – not unsubstantiated claims and anecdotal evidence. 3. The recent draft of the striped bass technical assessment reveals the striped bass fishery to be overfished with overfishing occurring. This is what the best available science has revealed and is consistent with what many in the recreational sector have been saying for years and in direct contrast to what the for-hire industry has been claiming. 4. The for-hire industry represents a minute fraction of the recreational fishing sector. Using the Vessel Trip Reports provided by the for-hire industry in 2018, there were less than 13,000 anglers on party boats where a striped bass was caught. These VTRs are required to be completed by the NY DEC. * 5. In contrast to the number of anglers on for-hire vessels, the NY Marine Fishing Registry has over 400,000 recreational anglers. * 6. There are over 8,100 recreational anglers in the NY Marine Fishing Registry that reside in Senator Kaminsky’s legislative district alone. * 7. Of the 515 for-hire permits issued in 2018 only 101 vessels submitted a Vessel Trip Report where a striped bass was caught. * 8. Only 8 of these vessels had more than 40 trips where striped bass were caught. * 9. The for-hire fleet continues to deny and discount the best available science with unsubstantiated claims about fish swimming in other parts of the ocean, effects of Hurricane Sandy, and more. None of these claims are backed by scientific research. 10. We have no interest in causing economic harm to the for-hire fleet. Our interest is in insuring a robust striped bass fishery that all segments of the recreational and commercial sectors can benefit from. We find the comments from the for-hire industry to be based primarily on their financial interests and they do not represent the great majority of conservation minded recreational anglers. 11. John McMurray has demonstrated an extraordinary grasp of fisheries management and marine science, not only for striped bass but all species he has been involved with on the ASMFC management boards. 12. We have not agreed with every comment that he has made or vote that he has cast but he has shown himself to be a fair representative of the overall recreational sector. *This data was provided by the DEC in response to Freedom of Information Act requests. From what I understand they are going to open the commercial harvest of striped bass two weeks earlier. I suggest you send her your comments if you do not think this is a good idea. NYSDEC will accept comments through April 15, 2019. You can direct comments and questions to Carol Hoffman at: 205 N Belle Mead Road, Suite 1, East Setauket, NY 11733 or carol.hoffman@dec.ny.gov. Below is the email I sent her. Hi Carol, From what I understand they are opening the commercial harvest season for striped bass two weeks earlier. The population is in trouble but instead of addressing the immediate problem, we are going to allow more to be harvested. This makes absolutely no sense. The ASMFC has stated they are being overfished along with the steep decline I have been witnessing the past several years, I strongly urge you to reconsider. Please see the attached letters I have sent to Governor Cuomo and the members of the ASMFC. Please feel free to reach out to me with any questions. Thanks. WTS my backup new Custom Century Stealth S-2 1326 11’ - 2-5oz Rod built by Chris Abut. It was wrapped with Fuji’s best Torzite guides. The rod is super light and can handle big fish in big current. It’s a parabolic rod that takes less energy to cast compared to the Slingshot series. $485 Stella 3000 Reel 9.5 out of 10. It includes everything that originally came with. $375 I would consider trade for other quality fishing products. 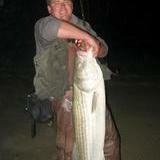 Hey everyone, Last year was the first year in a boat trolling tube n worm for stripers. Did very well in rivers where depths maxed out at 35' (all the way down to 4') using unweighted tubes with 40-50# braided fishing line. I am wondering if it would be beneficial to add an egg sinker (and what weight to add) for deeper water? Or would it be worth it to get a dedicated lead core setup? Ive seen many posts online that say the tube *needs* to be close to the bottom or close to where the stripers are, but clearly that isn't true from my experience. I'm just wondering if its worth the money to go lead core to get the tube down further, especially if it would help me catch bigger or more fish. Obviously adding a lead weight won't cost much and I'll definitely be trying it out this season. Also, I did not have any luck fishing the ocean (Long Island Sound, CT side) with the tube and worm. Would getting my tube down deeper help in this situation? Fished a few times near reefs and shoreline/structure with no luck. Thanks! Sharing your experiences or adding your input would be very beneficial. We know the Bass are in trouble, but what about the Bluefish? I grew fishing in the 80s when the Striped Bass fishing was terrible. Thankfully, we had big Blues to fill in that void. That is no longer the case and hasn't been so for a number of years where I fish on the SS of LI. Just recently they gave the unused recs quota to the comms which made absolutely no sense to me. Does anyone know if there is a new stock assessment coming up or is anything being done to address this? So I’ve been tying the Murdich Minnow a ton lately, tied in a size 4 on a Gamagatsu B10S just smokes smallies here on the Connecticut in western MA. But my frustration is with the Hairline Ice Fur used in the original formula. The hank you receive is pitifully small and only is enough for 5-6 flies. I’ve seen guys using EP fibers on the internets but haven’t tried it. Has anybody used a substitute matierial that goes a little further? I'm 15, should i get a 12" tracker jon boat and a 6-7 hp outboard or a kayak for long island sound fishing? I like the idea of bringing others out on the boat and have fun/playing music etc. kayak is half the price, yet slower with only room for one, and even fishing kayaks seem awkward to fish from too me. No budget for a Hobie. Today a little after noon striper madness began in the Saco river, the catalyst for this being a picture of a single schoolie at a now VERY popular fishing spot. Sadly I still have not landed one after seven outings this year but as usual I settled for a shad in order to end my skunking. I will probably be going after it every day until my first striper, may even be out somewhere on the river later tonight. Happy fishing to everyone and don't forget to release those cows safely . Does anyone know of any sealed fishing reals besides the van staal that would be affordable for surfcasting? Is the lamiglas blue water series spinning rod good for throwing swimbaits and plugs to striped bass? Any experience with it? Its rated 1-4, but how well can it throw lures on the upper end of its rating? What company and weight should I get for snaps swivels for Striped Bass?